Naturalization Ceremony on Citizenship Day! September 17th is Citizenship Day! We’re celebrating with thirty candidates who will become citizens of the United States in a naturalization ceremony at Hartford City Hall. We’re also celebrating National Welcoming Week (Sept 15-22), a week where we all highlight the contributions made in our communities by immigrants. All are welcome to attend the ceremony and witness this momentous occasion, from 11:45 a.m. until 12:30 p.m. on September 17th in the Atrium of Hartford City Hall, 550 Main Street. Music and remarks will be part of the agenda as the U.S. 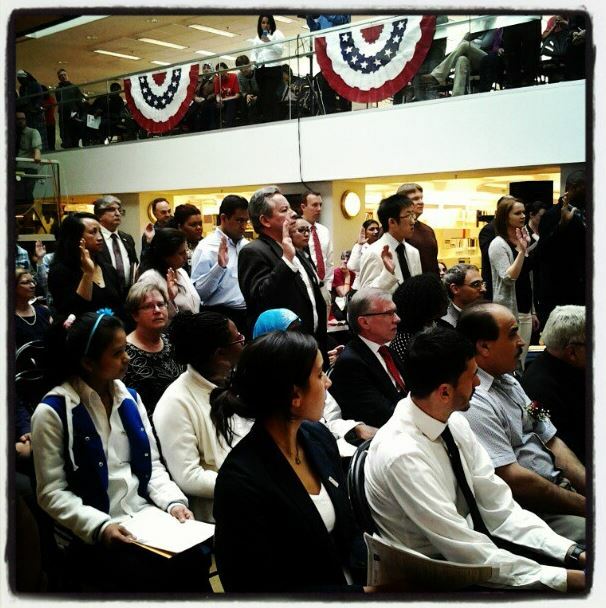 Citizenship and Immigration Services presents 30 candidates for U.S. citizenship. The Honorable Donna F. Martinez, United States Magistrate Judge, will administer the Oath of Allegiance to America’s newest citizens, who hail from many countries. HPL CEO Matthew K. Poland will provide the Naturalization Ceremony’s opening remarks, while keynote remarks will be made by the Honorable Pedro Segarra, Mayor of Hartford. Special elements of the September 17 ceremony also will include a presentation of the nation’s colors by the First Company Governor’s Foot Guard; students of the Library’s citizenship education program leading the Pledge of Allegiance; and performances by Tom Rotchford and The Mariachi Band / Los Tovardores de America.